Happiness may be elusive, but it sure has spawned a lot of aphorisms. Folk-wisdom indicates one can be happy as a pig in poop—or in mud, which makes me wonder if those two hogs are equally content, and if they had other options. It also suggests you can be pleased as a pig in a peach orchard, which would make sense unless harvest season was over. 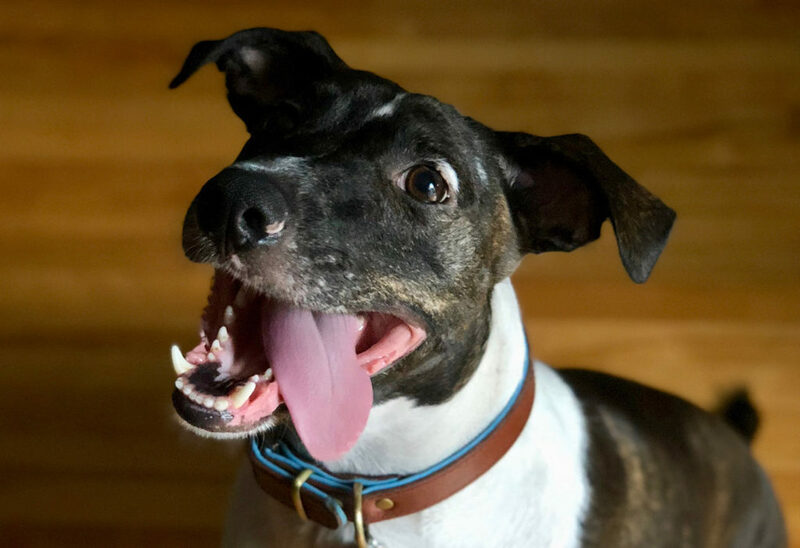 Additionally, one might feel happy as a pup with two tails, a monkey with a peanut machine, or a clam at high tide. With such a menagerie of animal comparisons, it seems fair to ask if animals are able to feel emotions such as happiness. Most biologists caution against anthropomorphizing, a term which sounds like it could mean morphing into an animal, in which case I would agree, because who knows if you would make it back again. Actually, what they are saying is that we should not ascribe human-like motives or emotions to wild or domestic animals. This is a hilarious warning given that we are after all a species of animal. According to a 2002 study published in the journal Science, our DNA is 98.77% identical to that of the chimpanzee. And yet some people think it far-fetched to imagine other species might have feelings similar to our own. But maybe we hesitate to look at animal bliss because no one quite agrees on what constitutes human happiness. Although biologists do not concur whether critters can be happy, there is ample science around what makes them miserable—animals and people both. Cortisol, a steroid hormone produced by most vertebrates in the adrenal glands in response to stress, is easily measured in saliva, blood, and other tissue as an indicator of stress. In humans, self-reporting of perceived stress correlates almost exactly with blood cortisol levels—in other words, you should believe people when they say they feel stressed. So we can tell when a fish, goat, or cow feels stressed-out rather than bothering with those pesky surveys. They were only ever returned by the dogs anyway, and even then they were drool-covered, and blank. Aside from the most basic needs such as food, water, exercise, and adequate protection from inclement weather, animals have an intensely strong requirement for social bonding. A 2017 study by insurance-giant Cigna Health showed that loneliness is a greater human-health risk than smoking a pack of cigarettes per day. Since we are the only animal species intelligent enough to smoke, it is not possible to make such exact comparison in other animals. But psychiatrist Terry Kupers, an expert on the effects of social isolation, states that the estimated 90,000 U.S. prisoners in solitary confinement undergo permanent, measurable brain damage after as few as three days, so the need to socialize may be on par with that for food and water. In fact, the Swiss government in 2008 made it a federal crime to isolate social animals. More than 70 years ago, psychologist Abraham Maslow developed a “pyramid of human needs,” which one could roughly equate to a checklist of items essential for happiness. Physical requirements form the base of his model, with freedom from violence on the next tier. Social needs are third-most essential, then a sense that one has a unique place in the world, followed by what he calls self-actualization, or the honing of one’s talents. In his model, one level’s needs must be met before those of the next layer become of concern. Of course, it’s not that simple, as the solitary-confinement example shows. 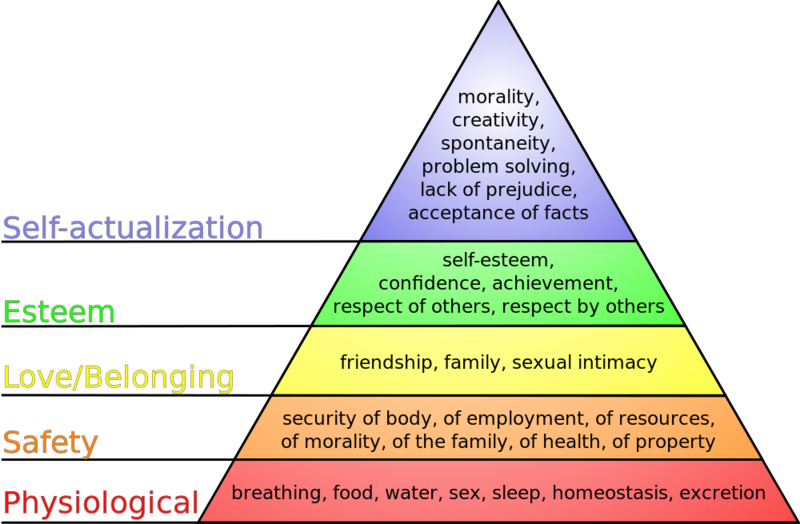 We all kind of get the first three layers where other animals are concerned, but applying the top two levels in Maslow’s model is tricky business, and may not be relevant for all species. It is easy to observe individuals seeking status in mammalian species, but slugs probably don’t do that. Or maybe it’s just too hard to tell them apart. But for domestic animals, we can see that mental stimulation and the opportunity to explore varied environments seem to correlate with well-being. Unless some kind of universal translator is invented, the debate over animal glee is likely to remain unresolved. One sticking point of course is the subjectivity of happiness. It’s commonly said that it is just a state of mind, and interviewing our pets only gets us so far. We can barely figure out our own feelings much of the time. It is curious that more and more, common beliefs that seemed a matter of opinion are now able to be quantified. For instance, the old saw that money can’t buy happiness is generally true. Obviously, we need a certain amount for survival, and a bit more to go from survival to comfort. But studies show that above about $75,000.00, additional income reduces one’s sense of life satisfaction, both as self-reported, and based on biological markers for stress. But sometimes, bucks can buy bliss. Writing for Psychology Today in August 2017, Dr. Mark Holder cited research showing that when money is given away, subjective happiness goes up, and cortisol levels and blood pressure go down. Voilà. I can prove satisfaction is not entirely in the head, though. It that were true, no one could ever be happy as a clam, an animal characterized by a distinct lack of head. Just elated to do my little part for science there. I have always been amused by how humans try to distance themselves from being animals.